BREAKING NEWS: Updated Feb. 17, 2018 at 11:30 a.m.
An Edgewood man and five others have been arrested and are facing charges of first degree murder in the shooting death of Mike Pelkey at Smith’s in Edgewood last Sunday, while one man remains at large. That’s according to an update released at midnight last night by New Mexico State Police. 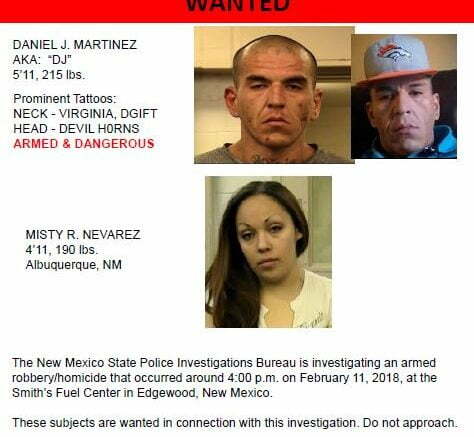 State Police said Daniel J. Martinez, 30, of Albuquerque is still at large and being sought by police. Police said he is armed and dangerous, and faces charges of first degree murder, armed robbery, tampering with evidence and possession of a firearm by a felon. State Police had said earlier the assailant was armed with a semi-automatic handgun. “Anyone with any information on their whereabouts is asked to call police,” said the State Police press release. 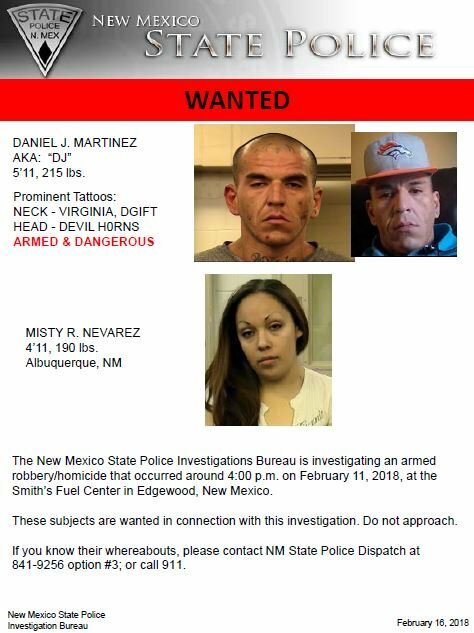 “Specific details relating to the robbery will not yet be released until all suspects have been apprehended.” Those with information may contact local law enforcement or State Police at 505-841-9256. Those arrested were Daniel J. Gonzales, 29, of Albuquerque, charged with first degree murder, armed robbery, tampering with evidence, and possession of a firearm by a felon; Morgan Ramirez, 30, of Albuquerque, charged with first degree murder, armed robbery and tampering with evidence; Donald Herbert Gregory, 46, of Edgewood, charged with first degree murder, armed robbery and tampering with evidence; Veronica M. Martinez, 30, of Albuquerque, charged with first degree murder, armed robbery and tampering with evidence; Eileen G. Sandoval, 48, of Albuquerque, charged with first degree murder, armed robbery and tampering with evidence. 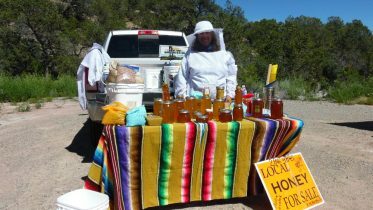 Today, Misty Roseanne Nevarez, 29, of Albuquerque, was arrested, with charges of first degree murder, armed robbery, and tampering with evidence. Last night, hundreds gathered at the Smith’s Fuel Center to pay tribute to and remember the slain gas station attendant who touched many people’s lives. One speaker urged the community to follow Pelkey’s example, and to find ways to come together and be of service to each other every day.